"First things first, I'm the realest" - Iggy Azalea think again: Hydrogen Hydroxide, aka Water! Water truly is the number one "realest" liquid to put in your body! The good ole H2O is the first thing that helped me notice a difference in weight loss. Studies show that drinking half of your body weight in ounces can aid in losing weight, and I agree 100%. Example of drinking half of your body weight: if I were to weigh 150 pounds, I would want to drink at least 75 ounces of water per day (that's equivalent to 4.5 standard water bottles, but I always aim to drink a gallon of water a day). It seems likes a lot but your body will love you for it, and your bladder can't wait to get rid of all of those toxins. So go grab a gallon of water and pour it into a Tervis, Camelback, or whatever water bottle you have to help you get all of the water you need throughout the day. 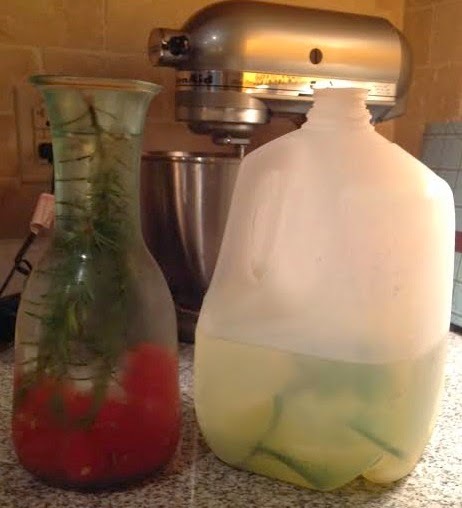 The first picture shows, to the left, water with rosemary and watermelon (I picture Beyonce singing that word). To the right, that's my water with cucumber, lemon, fresh mint leaves, and a teeny bit of ginger root (usually it's full in the morning, I took this picture mid-day). The second picture is… drum roll…. water! 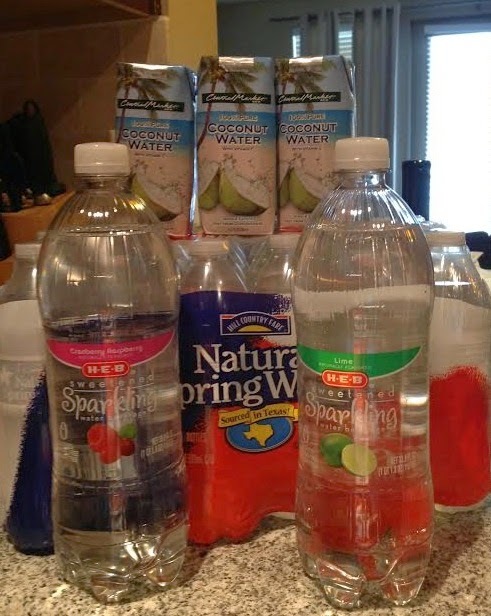 Coconut water, no sugar added sparkling water, and obviously a case of water. (Random fact about me: I love HEB). The sparkling water was recommended by my friend, Hannah, who has said goodbye to soda. She says the sparkling water is good if you just want that fizzy taste. Can't wait to try it! Coconut Water, one of my faves. It's a great replacement for Gatorade. Yes, the sugary good stuff that is filled with electrolytes. Well guess what, pure coconut water doesn't have that artificial sugar and it has way more electrolytes. It's actually one of the best hydrating drinks after a workout. **And for all of those "Five o'clock Somewhere" people, I was reading how coconut water pairs well with Malibu Rum, and I'm sure vodka too. Supposedly, since coconut water is filled with its awesome goodness, it can decrease hangovers and dehydration. So if you are looking for a healthier option to pair with alcohol, here it is! Oh and one more random thing I've noticed... not only does water flush out toxins, it can clear up your skin. Lately, I've been drinking a crap load of water with lemon, cucumber, fresh mint leaves, and a teeny bit of minced ginger root (I grated it with a cheese grater), and I swear to you that my face is getting clearer and has more of glow look to it! So drink up as much water as you can! It's good stuff. Hope you've enjoyed my thoughts and love for water. I plan on posting some recipes next, so be ready. P.S. Don't hesitate to ask me questions or if you have any requests/comments/suggestions, please send them my way! I look forward to hearing from ya'll!